With samples from Otis Redding’s “(Sittin’ On) The Dock Of The Bay” and Steely Dan’s “Peg,” De La Soul unleashed this bouillabaisse of good times onto a hip-hop public in 1989 with today’s Song Of the Day by Eric Berman. 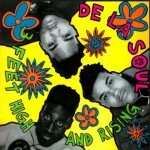 The 3 Feet High And Rising album is one of two stone-cold sample-delic masterpieces that came out that year along with The Beastie Boys’ classic Paul’s Boutique, and they both sound as fresh today as they did when they were newly minted. I was fortunate enough to see them perform shortly after the album’s release during the New Music Seminar in New York City opening for none other than George Clinton and the P-Funk All-stars. Not only was it a very late evening of music with the funksters doing their usual for then four hour set, but it was very memorable even after all these years.